Tuca Zbarcea & Asociatii launches Better Business in Romania 2019 - a user-friendly legislative guide dedicated to foreign investors interested in doing business in Romania. 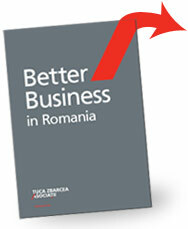 Țuca Zbârcea & Asociații launches Better Business in Romania 2019 - a user-friendly legislative guide dedicated to foreign investors interested in doing business in Romania. Tuca Zbarcea & Asociatii, named Most Innovative Law Firm of the Year in Romania at this year’s IFLR Europe Awards. Țuca Zbârcea & Asociații, named Most Innovative Law Firm of the Year in Romania at this year’s IFLR Europe Awards.